Blended with large amounts of hyaluronic acid with a high propensity for water and moisture retention plus large amounts of collagen. A moisturizing lotion for those particularly concerned about dry skin. 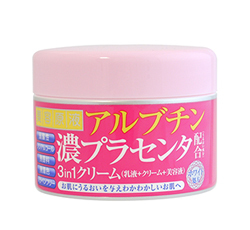 Blended with large amounts of arbutin and placenta with a high propensity for whitening the skin. 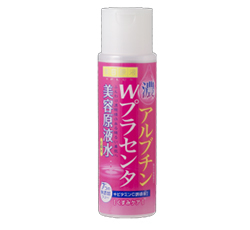 A skin lotion which gives moisture and transparency for those concerned about dull looking skin caused by drying. 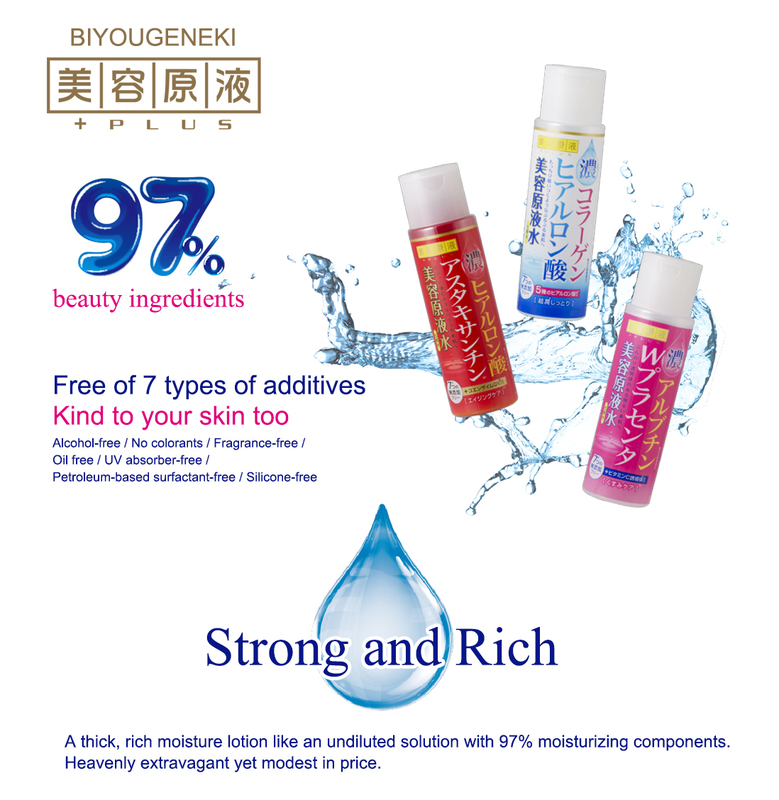 A beauty essence blended with high concentrate moisturizing components, collagen and hyaluronic acid. 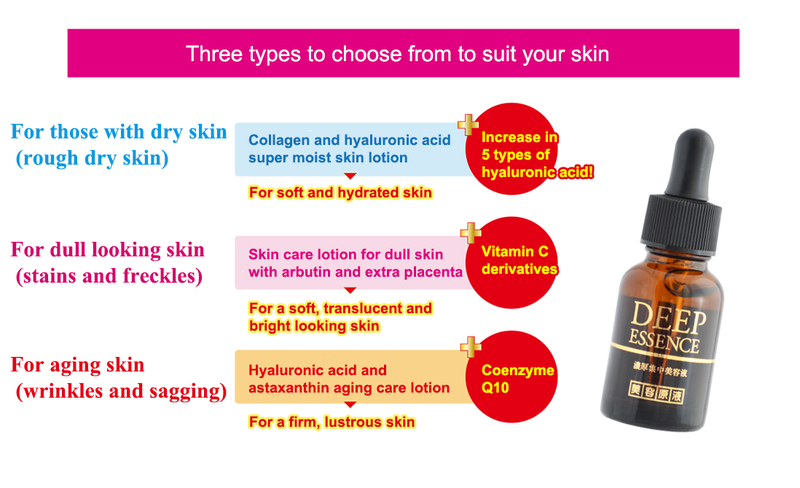 Can also be used by adding a drop to your usual skincare treatment. A beauty essence blended with high concentrate moisturizing components, arbutin and concentrated placenta. 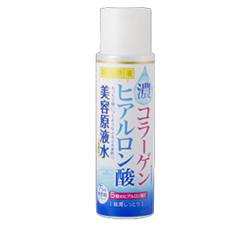 Can also be used by adding a drop to your usual skincare treatment. A beauty essence blended with high concentrate moisturizing components, astaxanthin and hyaluronic acid. 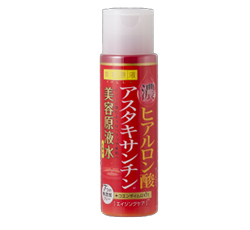 Can also be used by adding a drop to your usual skincare treatment. Emulsion + Cream + Beauty Essence, combined as 1! A 3 in 1 beauty cream blended with exceptional beauty components, placenta and arbutin, to give a moist, translucent, white looking skin. Emulsion + Cream + Beauty Essence combined as 1! 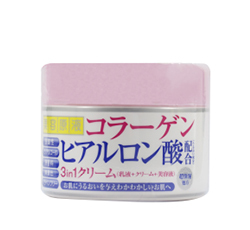 A 3 in 1 beauty cream blended with exceptional beauty components, hyaluronic acid and collagen, to give moist, elastic feeling skin. A beauty cleansing gel with hyaluronic acid and collagen giving the skin a firm, elastic feel, easily removes heavy make-up and leaves the skin feeling super moist after washing. A beauty cleansing gel with arbutin and placenta giving the complexion a bright, translucent look, easily removes heavy make-up and leaves the skin feeling fresh and moist after washing.